For every new business owner, there are certain moments that really make you stop and think, “Wow! I made a business.” And more than simply magic moments, these events are also important milestones reached by a budding business. Perhaps surprising, however, is that many of these moments are just that — momentary. These are fleeting things like opening the first piece of mail at your brand new location, handing out your first business card with its painstakingly created logo, and seeing your company name embossed in all its glory on the front of your first business credit card. But those moments don’t just happen. It can be difficult to choose the right location, logo, and business name for your new business. Thankfully, choosing the right business credit card can be made easy with a little research. While many of the things you need to establish your new business can be accomplished in a relatively short time — you can complete the legal steps to start your company in about a week — actually building your business into a success takes time. The same is true for building your business’s credit; it can take months to build enough credit to qualify for a business credit score, let alone reach the upper echelon. While a strong personal credit score can help you qualify for a business credit card before your company’s credit is established, business cards for fair-credit companies are available from some major banks. You can find both secured and unsecured business cards to help you get started. The Capital One® Spark® Classic for Business is rare in that it is an unsecured business credit card that accepts less-than-great credit scores, plus it offers unlimited cash back rewards. The Wells Fargo Business Secured Credit Card is a secured business credit card that requires a deposit to open. Your credit line will be equal to the amount of your deposit. As a secured credit card, the BBVA Secured Visa® Business Credit Card requires a deposit to open. The size of your credit line will then be equal to 90% of your deposit amount. You can increase your deposit (and, thus, credit line) at any time in $100 increments. You can also obtain free employee cards and special Visa Business benefits. As with consumer credit, the key to building a solid business credit profile is to ensure you pay all of your debts on time and as agreed upon. You’ll also want to ensure that your business creditors are reporting your payments to the credit bureaus so that each account helps to build your profile. If there’s one thing new businesses are often short on, it’s capital. So why waste funds on a credit card annual fee when you have other options? With good credit, you can find a range of quality business credit cards that not only charge no annual fee, but also offer purchase rewards to help you save even more on your bottom line. 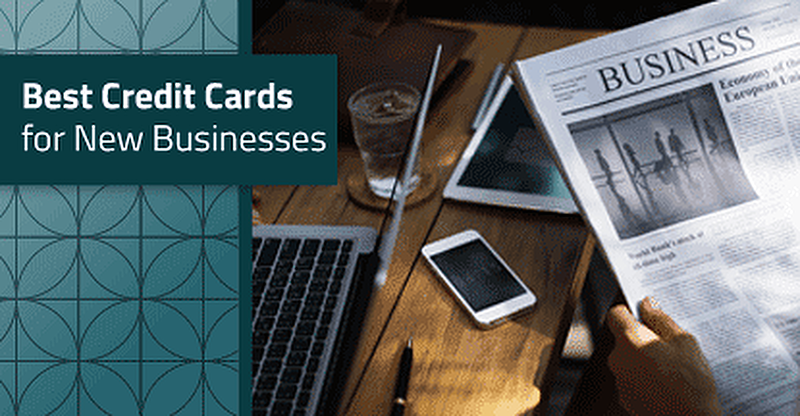 The Ink Business Cash℠ Credit Card offers great rewards for common business expenses, as well as additional rewards in other useful categories and unlimited rewards on all other purchases. With no annual fee and an introductory 0% APR offer, few things will stand in the way of you and the cash back rewards you earn with your Ink Business Cash card. Not only can you earn unlimited cash back rewards with the Capital One® Spark® Cash Select for Business, but the introductory 0% APR offer makes one less thing to worry about while you grow. The Capital One® Spark® Miles Select for Business is a solid no-annual-fee travel rewards card that can help you earn miles while you build your business. Plus, redeem those miles with no blackout fees, making it easier to rep your business anywhere. Although these cards may not have annual fees, that doesn’t mean they’re free of all fees. Not only will you be charged interest fees if you carry a balance (unless you have an intro-APR deal in place), you may also be charged fees for using certain services, like making cash advances or foreign transactions. Check your cardholder agreement for details on your card’s fees. Few business owners are likely to turn down extra cash, especially those with a new business to build. Cash back credit card rewards provide a simple way to take the edge off your purchases with flat-rate rewards that can be redeemed for a credit card statement credit. Choose between higher-rate unlimited cash back or bonus cash back in popular categories to maximize your rewards. While the annual fee for the Capital One® Spark® Cash for Business is only waived the first year, you can easily earn enough 2% cash back rewards to cover the cost by spending just $4,750 a year on your card. If you want unlimited cash back rewards on your business purchases, but don’t want to deal with an annual fee, the Ink Business Unlimited℠ Credit Card could be a great option. On top of its unlimited 1.5% cash back, this card comes with a huge signup bonus, as well as an intro-APR deal on new purchases. The SimplyCash® Plus Business Credit Card provides a solid earnings rate for common business categories, as well as letting you choose your 3% bonus category from a range of options including gas stations and restaurants. The SimplyCash® Plus Business Credit Card may be a good choice for those who occasionally find the need to spend above their credit limit to handle unexpected business expenses, as it allows you to go over your limit with no extra fees (the amount you can go over will vary by individual account). No matter how high the earnings rate on your cash back card, remember that it will likely be much lower than the interest rate you’re charged (unless you have an active intro-APR offer). This means interest fees can easily eat into your rewards — and then some — if you carry a balance on your card from month to month. Although the digital age has made it increasingly easier to run a business without an office, many new businesses still require a physical presence — which will, inevitably, mean office supplies. From computers and USB sticks to good-old-fashioned paper and pens, most new businesses will get to know their local office supply store fairly well. With a good business credit card, you can save on all those purchases, earning bonus rewards for every swipe. Getting your new business stocked up on office supplies can be a little more affordable with this cash back card. You’ll earn 5% cash back on up to $25,000 in combined office supply, internet, cable, and phone service purchases each year. Plus, enjoy a solid signup bonus, an intro-APR offer, and no annual fee. With the U.S. Bank Business Edge™ Cash Rewards World Elite™ MasterCard®, you can earn bonus rewards for not only those seemingly endless office supply runs, but also the gas to get there. The U.S. Bank Business Edge™ Cash Rewards World Elite™ MasterCard® also comes with a nice intro-APR offer that lets you make purchases interest-free for up nine months. One of the only airline-branded business cards that rewards you for office supply purchases, the United MileagePlus Explorer Business Card will help you earn your way toward free flights with every pen and Post It purchase. The miles you earn with your United MileagePlus Explorer Business Card won’t expire as long as your account stays open, and there’s no limit to the number of miles you can earn. When using your business card to purchase printer ink and sticky notes, be sure to think a little outside the pencil box; many modern office supply stores sell far more than the office basics. You may also be able to earn bonus rewards on things like cleaning supplies, packing materials, and printing needs at your local office supply store. Building a business is often an exercise in hard work and decision-making, requiring a strong focus and dedication to your vision from the very start. Even the most foundational decisions, such as choosing a name and a logo, can be a challenge if your goals aren’t clear. Similarly, choosing the right business credit card to start building your business’s credit can be difficult if you don’t know what you really need out of that card. Once you’ve laid out your requirements, however, that decision often becomes significantly easier.